Planning a weekend in Las Vegas? 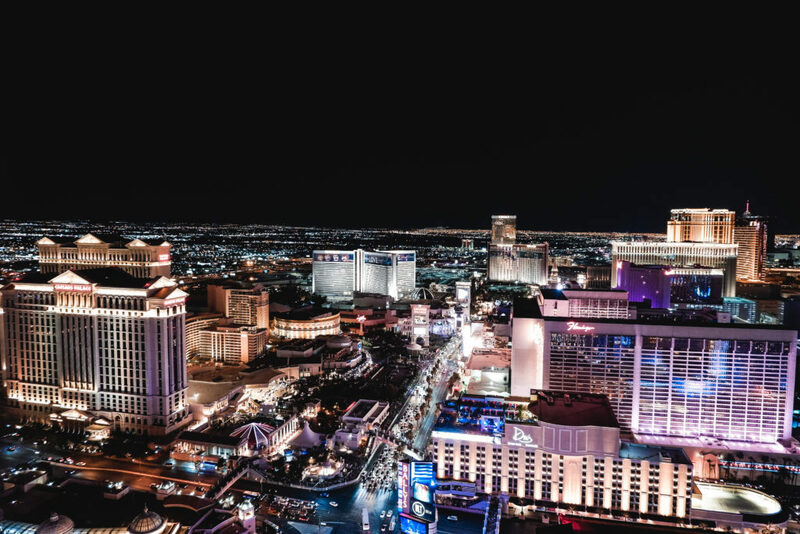 If you only have 48 hours in Las Vegas or less, we have the perfect itinerary written by a local to make the most of your short visit. Read on for the best things to do, where to eat, play and stay and other essential insider information. 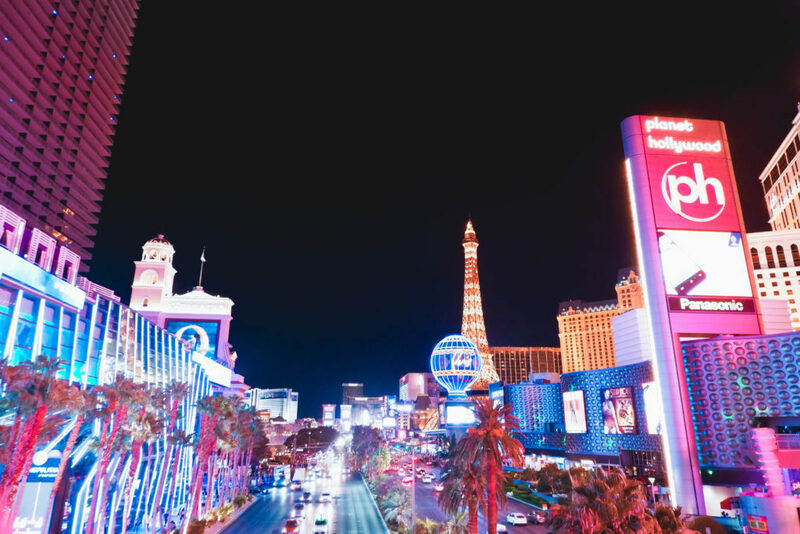 It’s no secret that planning a Las Vegas vacation can be quite overwhelming – From finding the right accommodations, looking for fun activities and researching this crazy town, it’s definitely not easy. Now, trying to plan how to spend 48 hours in Las Vegas is a whole different level of stressful but rest assured, this is why you’re here. 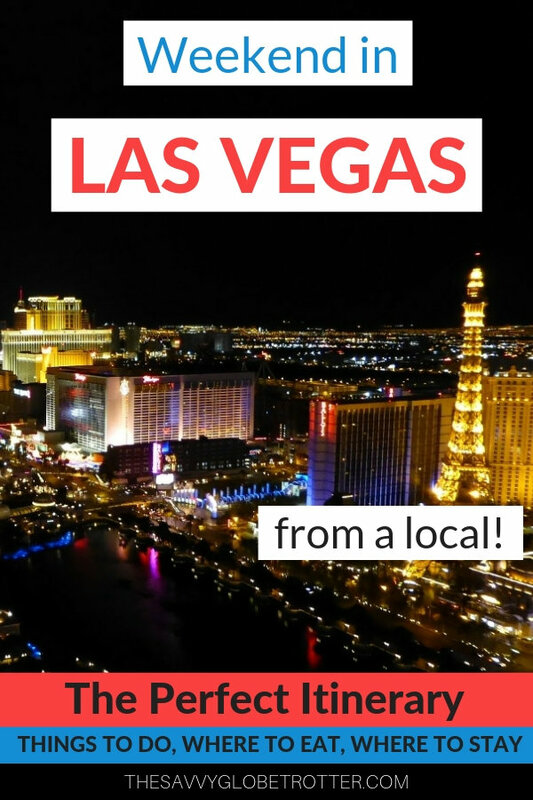 I created this Las Vegas itinerary just for you to make your trip planning as smooth as possible. I have lived in Vegas for almost two decades so I guess you can say I know this city pretty well. Las Vegas is recognized around the world as being one of the best cities in the world. This town always goes above and beyond to make sure its guests have nothing short of a phenomenal time. It is mostly known for it’s insane nightlife, over-the-top shows, crazy pool parties, amazing cuisine and gambling scene. 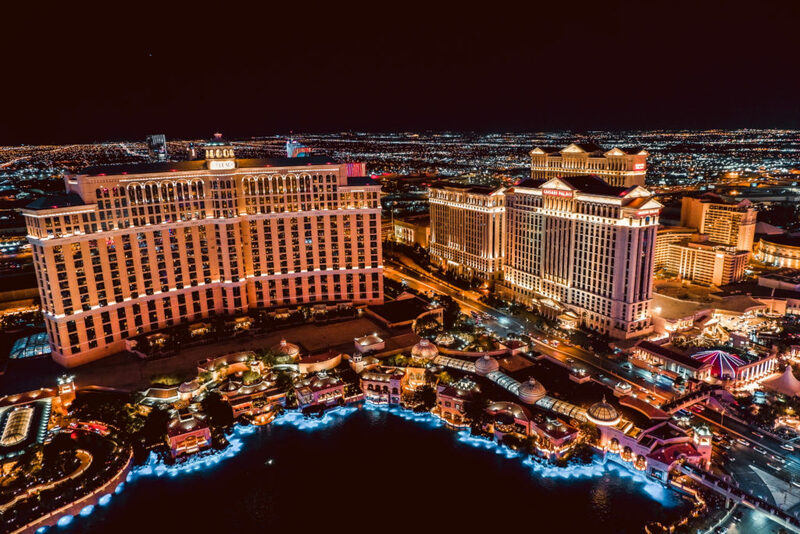 In this Las Vegas itinerary I will show you exactly how to make the best of your 48 hours in Las Vegas and give you all the best insights on the entertainment capital of the world! Welcome to Fabulous Las Vegas! Let’s get you checked in and ready to get your day started. On the first day of any vacation, I always like to take things a little slow. 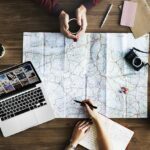 Traveling is not an easy task, depending where you came in from, you might be suffering from jet lag or just tired from your trip. I stumbled upon this café after a wild night out. After having a few drinks (a lot of drinks), I was quite famished and decided to stop at The Grand Lux Café to get some much needed food in my stomach. Ever since then, this restaurant has grown to be one of my favorite dining establishments in Vegas. Located inside the Venetian Casino, this restaurant serves nothing but delicious, mouth watering food. It has a wide variety of American cuisine and is opened 24/7. You really can’t beat that. Located in Downtown Las Vegas, the Neon Museum is an outdoor museum which displays all the iconic signs from old Vegas and the casinos that have been demolished. It is quite fascinating getting to witness old Las Vegas and seeing how much this city has transformed over the years. Near the Neon Museum you will find Fremont Street Experience – Fremont is a street located in downtown Las Vegas where some of the oldest hotels lie. Fremont is an absolute must to visit during your weekend in Las Vegas. It also features a 1500 foot LED screen suspended 90 feet above the floor for an amazing 6 minute light show. Fremont is also home to SlotZilla – SlotZilla is a slot machine inspired zip line that will send you flying through downtown Las Vegas. The perfect ride for thrill seekers! Another must do activity to add to your Las Vegas itinerary is visiting the observation deck at The Stratosphere. As the tallest structure in Las Vegas, you will not be able to get a better panoramic view of Las Vegas anywhere else. And for all you dare devils out there, not only will you get to witness a breathtaking view but The Stratosphere also has three insane thrill rides at the top of the tower. The rides include the Big Shot, Insanity and X-Scream. If that’s not enough for you, you can also participate in the Sky Jump, where you get to jump off The Stratosphere with a controlled bungee jump, going up to 40 miles per hour! Definitely not for the weak hearted! Located at the Fashion Show Mall, Benihana is an amazing hibachi style Japanese restaurant. They have an extensive menu with so many options as well as some delicious adult beverages. You can request for the food to be cooked in front of you as well, that way you can have lunch with a show. The Fashion Show Mall is the biggest shopping mall in the Las Vegas area. This incredible three story mall is home to seven major department stores and over 250 other stores and restaurants. If you’re looking to going shopping till you drop the Fashion Show Mall is the place to go. PBR has to be one of my all time favorite Las Vegas bars. It offers great comfort food, indoor and outdoor seating, live music and a mechanical bull. I have had some of my wildest nights there. Although, on the weekdays it tends to be on the quieter side but if you come on a weekend, get ready to party! End your first day in Las Vegas by treating yourself to a show. Vegas always makes sure to go absolutely above and beyond with their over-the-top shows. They invest millions and millions of dollars into their productions and the hard work shows in the end results. Cirque Du Soleil is responsible for seven of the biggest shows in Vegas but rest assured, there are a lot more shows in this small Nevada town. The best part, there is a company in Las Vegas called Tix4Tonight, it has locations scattered all throughout the strip and if you find one of those locations, they offer tickets for up to half off the box office price! So be sure to add a show to your Las Vegas itinerary, you will not want to miss this. Inside The Wynn Casino, you will come across Terrace Pointe Café. The Wynn has been voted “Best Hotel in Vegas” so you can only imagine, anything inside this casino is incredible. The food here is delicious! Terrace Pointe Café opens its doors at 6 AM, so make sure to come over and grab some breakfast before starting your day. Vegas is known for its insane, wild pool parties. If you’re visiting during the summer, visiting a day club is a no brainer. I personally prefer day clubs over night clubs. Partying in my swimsuit by the pool all while getting my tan on is definitely more my cup of tea than night clubs. Plus, what’s better than getting a little day drunk? This town has countless day clubs, some of my favorites are Drai’s Beach Club (Nothing like a rooftop party), Marquee Day Club and Wet Republic at the MGM. Wet Republic is known for some major celebrity sightings as well! If you are looking for one of the best restaurants in Las Vegas, look no further! Gordon Ramsay’s Hell’s Kitchen has that covered. Located right near Caesars Palace, this restaurant will leave you in a food coma. The food is absolutely to die for! What I love most about my city is that it replicates other parts of the world through their hotels. The Paris Hotel is based off Paris, France, The Luxor is based off Egypt and the list goes on. So its kind of like visiting a bunch of countries in one. 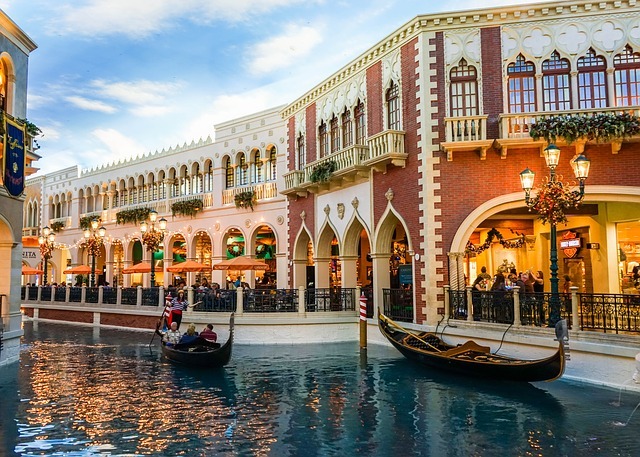 If you’re looking for a taste of Italy, make sure to take a Gondola Ride through The Venetian. 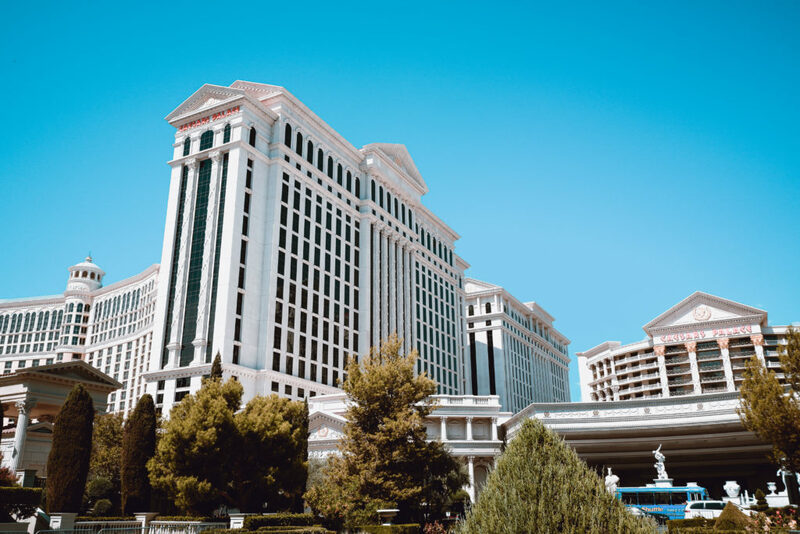 The Venetian based its architecture off the beautiful Italian town of Venice, it’s so well replicated you might even forget that you’re in Las Vegas. Standing about 550 feet off the ground the High Roller is a gigantic Ferris wheel. It is located smack dab in the heart of the Las Vegas strip. A single ride takes about 30 minutes and you can also pay a little extra to get a full open bar in your cubicle! Drinks with a view is as good as it gets. Hands down, one of my absolute favorite restaurants in Las Vegas. If you’re a steak lover, this is the place for you! Mon Ami Gabi, located inside the Paris Hotel and Casino has the best steak in the Las Vegas area. My recommendation to anyone is to order the Bernaise Steak and Frites. Your taste buds will be in food heaven! What I love most about Mon Ami is that you have two different dining options – Inside dining and outside dinning. 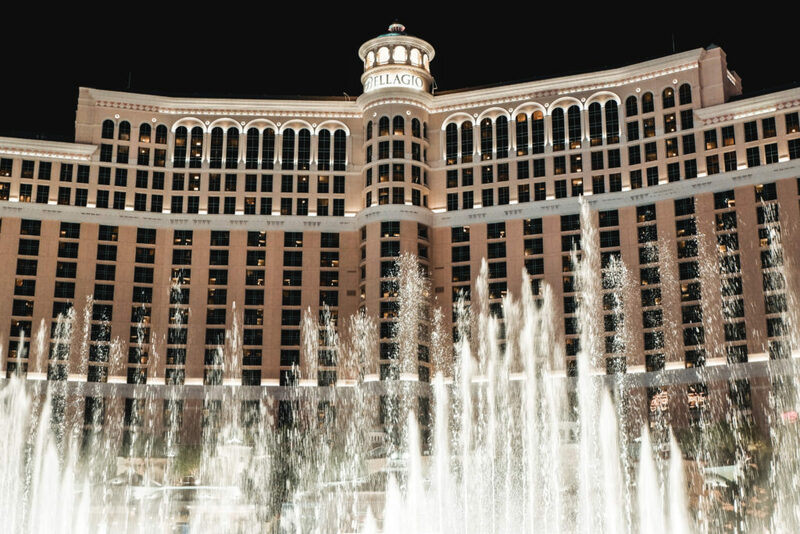 If you decide to dine on the patio, you will get an unobstructed view of the Bellagio fountains show across the street. The perfect touch to the perfect dinner. 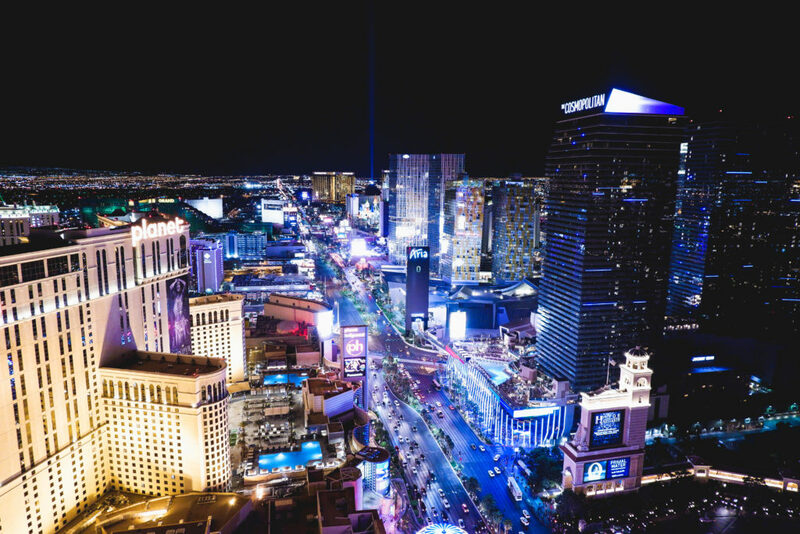 As your 48 hours start to come to an end, you can’t leave Vegas without experiencing what its known for – The nightclubs! With so many different options you definitely can’t go wrong in this area. All the clubs out here are unique and each have their own special touch but they are all equally amazing. Some bigger than others of course but they are all the life of the party. My two favorite clubs have to be OMNIA and Hakkasan at the MGM. 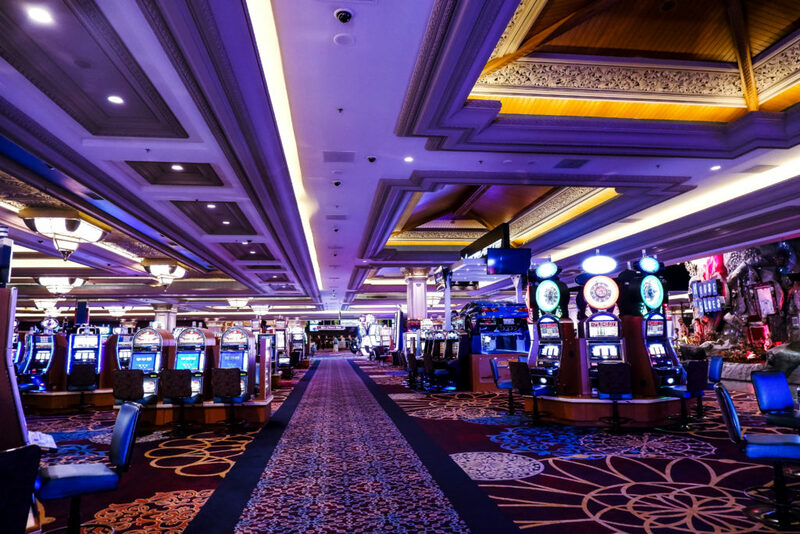 Located at Caesars Palace, OMNIA was created with $107 million budget and with that kind of moolah you are sure to get a pretty amazing result. 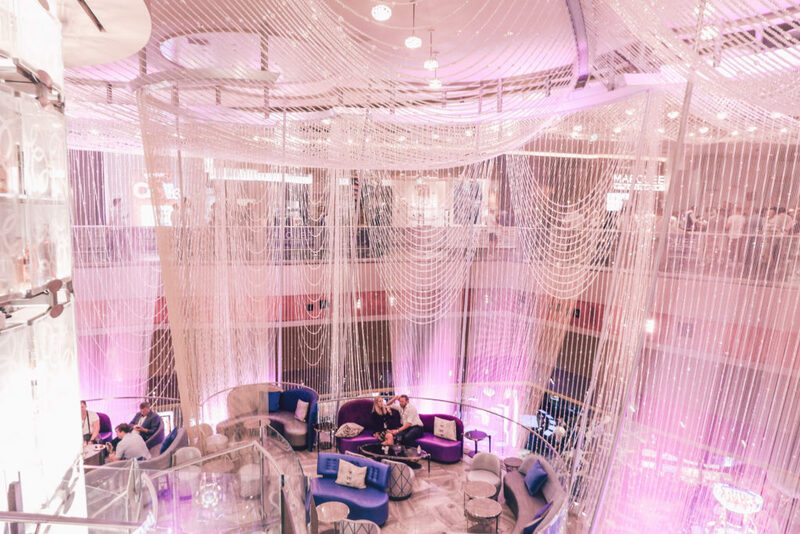 OMNIA is also known for its signature touch and that’s its 22,000 pound shape shifting chandelier. Only in Vegas will you see something like that. Hakkasan is MGM’s biggest club with a whopping 3 stories attached to it, only the biggest performers in the world play at Hakkasan. When visiting a new city, it’s hard to know what to expect. But what better way to learn than from a local herself. Here are some of my best tips for a first time visitor in the city of entertainment. As mentioned above, Las Vegas throws some wild pool parties. I would say summer time is the best time to visit. Keep in mind though, temperatures can reach above 110°F so always stay hydrated. This Vegas heat is absolutely no joke. Every event in Las Vegas deserves its own different outfits. For a summer time visit, you are going to want to focus on swimwear, club wear and formal wear. Swimwear for the obvious (Relaxing by the pool/pool parties), club wear (Also obvious) and formal wear for things such as shows and nice dinners. 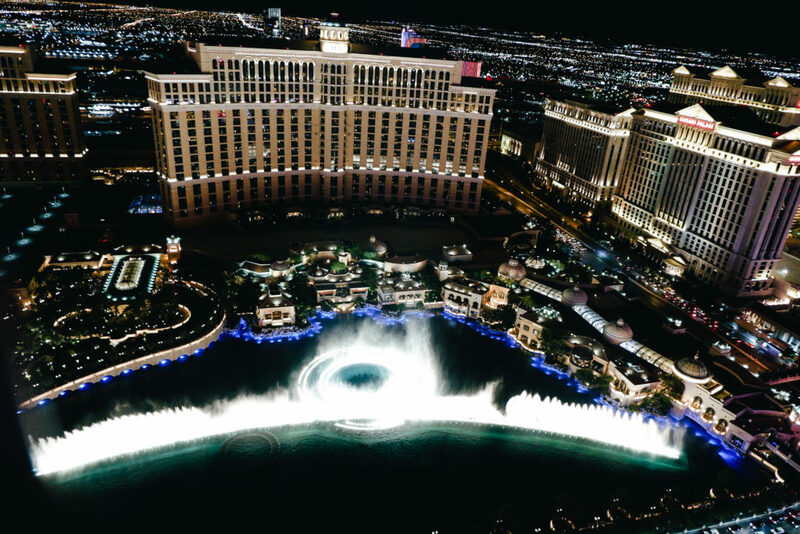 If you would like to learn more about what to pack for the ultimate Vegas vacation, check out my Las Vegas Dress Code and Packing Guide. Las Vegas is pretty small to begin with, unless you’re taking a road trip and already have a car, a car is not necessary. The whole strip is pretty much walkable so I would recommend sticking to Uber/Lyft/taxis if transportation is absolutely needed. Although Fremont hotels are quite a bit cheaper than the strip, I would actually recommend staying on a strip based hotel. In this case the saying, “You get what you pay for” couldn’t be more true. Staying at a hotel on the Vegas strip you will definitely get your moneys worth. Purchasing a strip hotel will ensure you are right in the middle of the actions and there are a lot more activities to be done. My top three favorite hotels are Paris Hotel and Casino, Caesars Palace and any of the City Center hotels. You can’t go wrong with any of these. Bio: Hi there! My name is Caresa. I am a travel and fashion blogger at This Spontaneous Life. 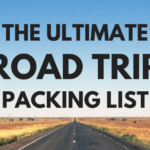 I just recently sold all my belongings to become a minimalist and be able to travel the world without limitations. You can follow me on facebook, pinterest and instagram. This covers Vegas well, eating at Hell’s Kitchen is on my bucket list too! Great stuff, I’m seeing some things on this list that I haven’t seen elsewhere, so that’s a good sign! I wish I had this guide a few weeks ago! We visited some family and stayed at Circus Circus, not an amazing experience lol. I would love to go back and stay at Caesars Palace and try some of the food you suggested. Believe it or not I’ve never been to Vegas! I am not much of a gambler but I could totally get behind the shopping, restaurants and a rooftop pool or two!